Stage nine of the 104th Tour de France saw the victory of Colombia's Rigoberto Uran in Chambéry after a fierce battle in three Hors-Category climbs. It all came down to a six-man sprint which included yellow jersey holder Chris Froome,. Uran (Cannondale-Drapac) took his revenge over Frenchman Warren Barguil who deprived him of a highly awaited success in stage 16 of the 2013 Vuelta a España at Aramon-Formigal. Robert Gesink, Geraint Thomas and Richie Porte all abandoned after different crashes. 193 riders started stage nine in Nantua. As Tim Wellens (Lotto-Soudal) was the first to attack right after the send off up the first climb of the day. A lead group of 40 riders was formed after the côte des Noyelles at km 5, which enabled Thibaut Pinot (FDJ) to crest the first two climbs of the day in the first position. After losing Eduardo Sepulveda (Fortuneo-Oscaro) in a crash at km 17, the front group was: Jan Bakelants, Axel Domont and Alexis Vuillermoz (AG2R-La Mondiale), Jesus Herrada and Carlos Betancur (Movistar), Bauke Mollema and Jarlinson Pantano (Trek-Segafredo), Alessandro De Marchi and Amaël Moinard (BMC), Bakhtiar Kozhatayev and Alexey Lutsenko (Astana), Kristjian Durasek and Vegard Stake Laengen (UAE), Thibaut Pinot (FDJ), Michael Albasini (Orica-Scott), Zdenek Stybar (Quick-Step Floors), Pawel Poljanski (Bora-Hansgrohe), Robert Kiserlovski and Tiago Machado (Katusha-Alpecin), Tiejs Benoot, Thomas De Gendt, Tony Gallopin and Tim Wellens (Lotto-Soudal), Michael Matthews, Nikias Arndt, Warren Barguil, Simon Geschke and Laurens ten Dam (Sunweb), Nicolas Edet and Dani Navarro (Cofidis), Primoz Roglic (LottoNL-Jumbo), Thomas Voeckler and Sylvain Chavanel (Direct Energie), Pierre Rolland and Dylan Van Baarle (Cannondale-Drapac), Tsgabu Grmay and Javier Moreno (Bahrain-Merida), Brice Feillu and Pierre-Luc Périchon (Fortuneo-Oscaro). The 39-man leading pack started the first Hors-Category climb of the 104th Tour de France with an advantage of four minutes over the bunch led by Team Sky. Roglic crested the col de la Biche in first position. The three AG2R-La Mondiale riders split the group into pieces on the descent before Geraint Thomas (Sky) crashed in the peloton and abandoned with a broken collarbone. Alexis Vuillermoz (AG2R-La Mondiale), Jarlinson Pantano (Trek-Segafredo), Tiejs Benoot (Lotto-Soudal) and Warren Barguil (Sunweb) rode away up the Grand Colombier. Barguil was first at the summit six minutes before the yellow jersey group and a 12-man group was reunited in the valley on the way to the Mont du Chat. 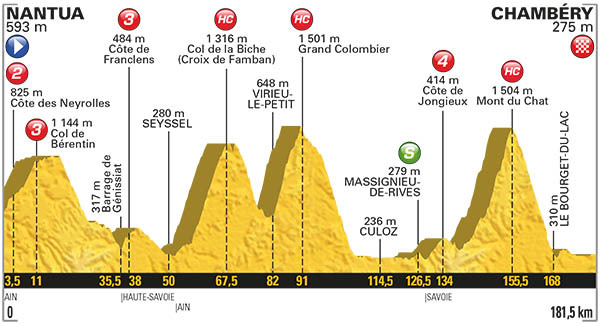 They passed the intermediate sprint at km 126.5 in the following order: Matthews, Bakelants, Gallopin, Geschke, Benoot, Roglic, Mollema, Barguil, Navarro, Pantano, Vuillermoz and Betancur. Bakelants and Gallopin went on after the sprint and rode together to the Mont du Chat. Gallopin soloed with 33km to go at the beginning of the climb but Barguil passed him 6km before the summit. The Frenchman from Sunweb then crested Mont du Chat alone in the lead but was caught at the end of the downhill by Romain Bardet (AG2R-La Mondiale) who rode away from the yellow jersey group after Richie Porte (BMC) badly crashed and abandoned. Bardet was alone at the front from 12 to 2km to go but five riders chased and brought him back. Jakob Fuglsang (Astana) launched the sprint from far out trying to repeat the victory he got after climbing the Mont du Chat at the Critérium du Dauphiné but Rigoberto Uran (Cannondale-Drapac) and Barguil passed him. 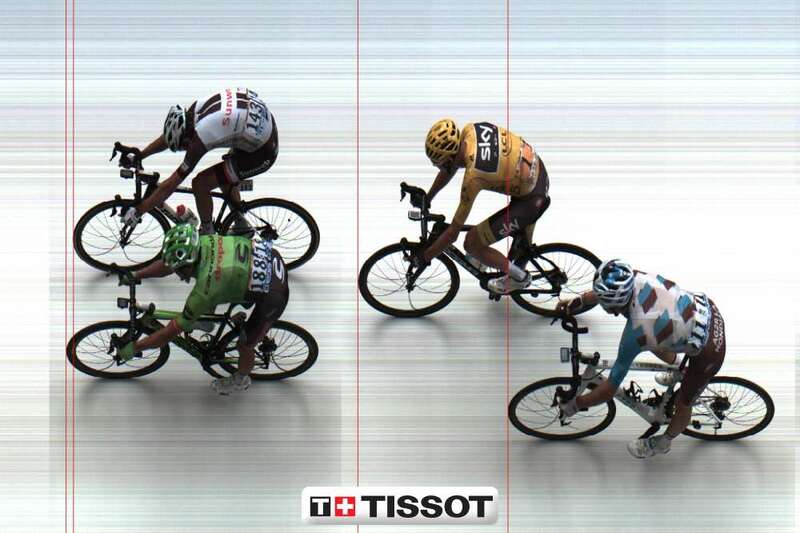 Thirty year old Uran, was declared a Tour de France stage winner for the first time in this very tight sprint (photo finish). 6 Jakob Fuglsang (Den) Astana Pro Team all s.t. 11 Simon Yates (GBr) Orica-Scott all s.t. 14 Louis Meintjes (RSA) UAE Team Emirates both s.t. 20 Alberto Contador (Esp) Trek-Segafredo all s.t. 23 Daniel Navarro (Esp) Cofidis, Solutions Credits s.t. 25 Carlos Alberto Betancur (Col) Movistar Team s.t. 28 Jarlinson Pantano (Col) Trek-Segafredo both s.t. 30 Guillaume Martin (Fra) Wanty - Groupe Gobert s.t. 33 Sylvain Chavanel (Fra) Direct Energie both s.t. 36 Pierre Rolland (Fra) Cannondale-Drapac Professional Cycling Team both s.t. 42 Alessandro De Marchi (Ita) BMC Racing Team all s.t. 45 Andrey Zeits (Kaz) Astana Pro Team both s.t. 111 Damien Howson (Aus) Orica-Scott all s.t. 119 Johan Esteban Chaves (Col) Orica-Scott all s.t. 123 Reto Hollenstein (Sui) Katusha-Alpecin all s.t. 132 Nikias Arndt (Ger) Team Sunweb all s.t. 134 Tsgabu Gebremaryam Grmay (Eth) Bahrain-Merida s.t. 137 Rafal Majka (Pol) Bora-Hansgrohe s.t. 180 Yohann Gene (Fra) Direct Energie all s.t.